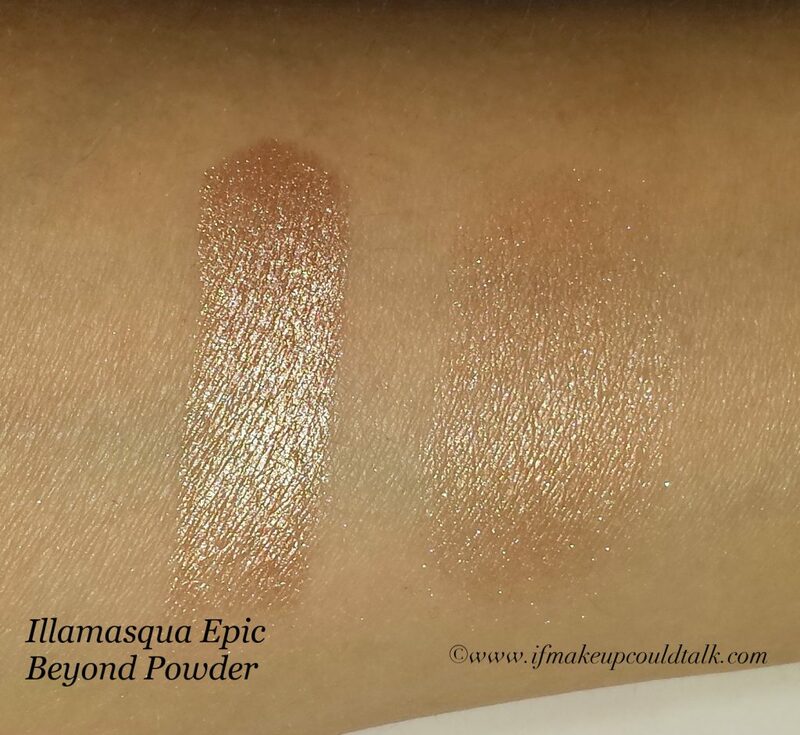 Illamasqua Epic Beyond Powder review and comparisons. 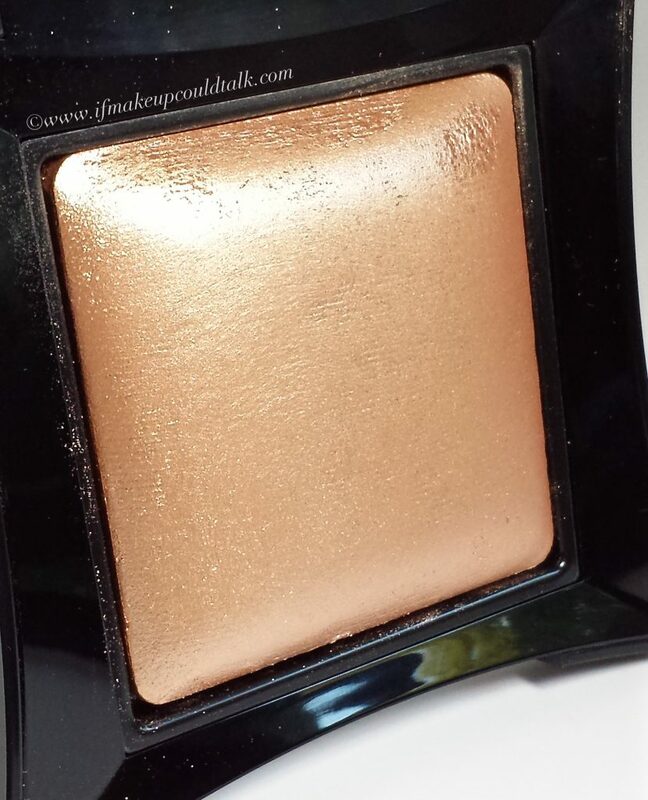 Let me preface this post by stating the obvious–I am weak when it comes to illuminators. My flippant attitude toward my addiction may seem amusing, but in all honestly, I really cannot resist highlighting powders. My collection is filled with various colors, textures and brands to last several lifetimes, yet, I opt to purchase new ones time and time again. 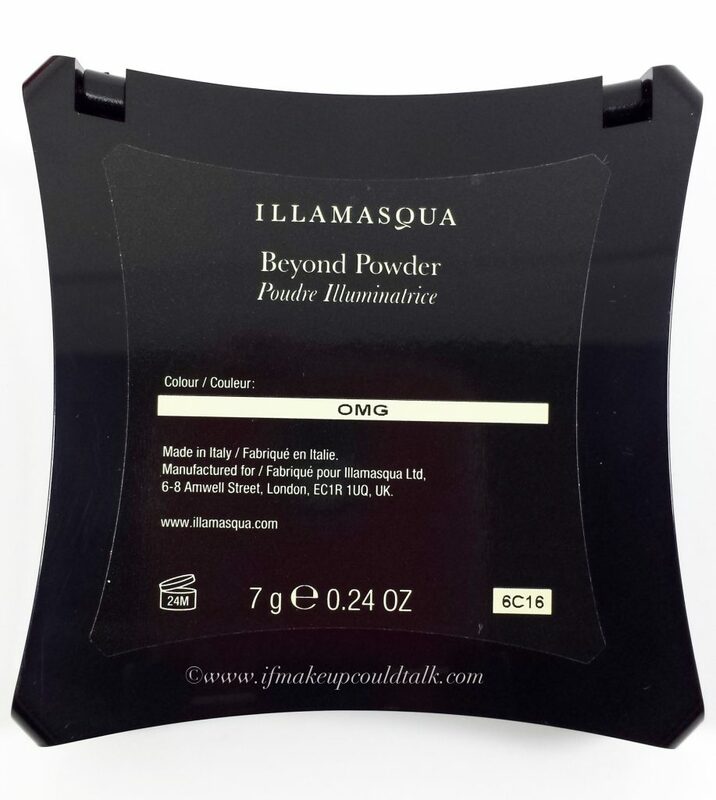 Seemingly discontent (aka: bored) with all the native offerings, I headed overseas to Illamasqua Epic Beyond Powder ($45 USD/7g). 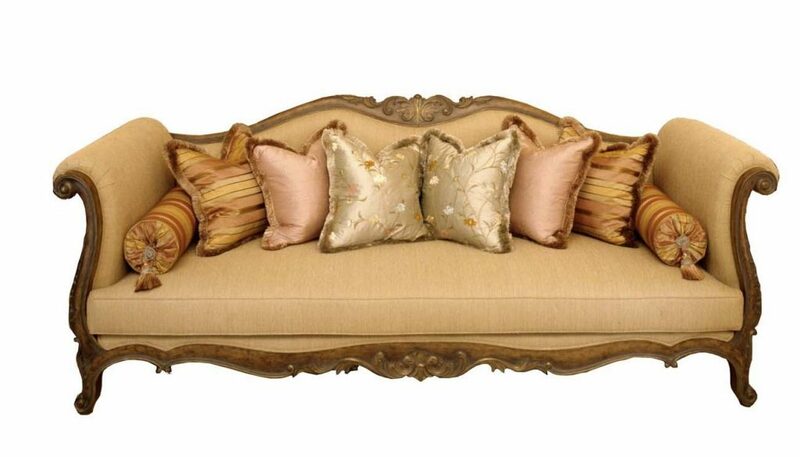 The enticing gleam, pillow-like appearance, exquisite packaging and the golden/copper coloring had me at “ADD to CART.” I hope you enjoy! 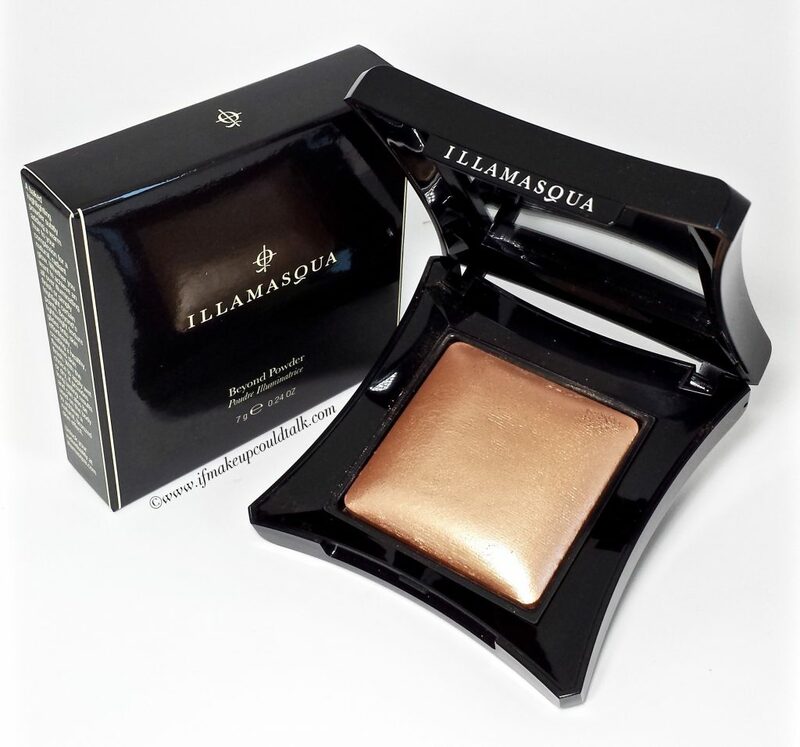 Beautifully presented product–from the design of the powder to the lightweight stylish compact. Compact comes with a sizable distortion-free mirror. 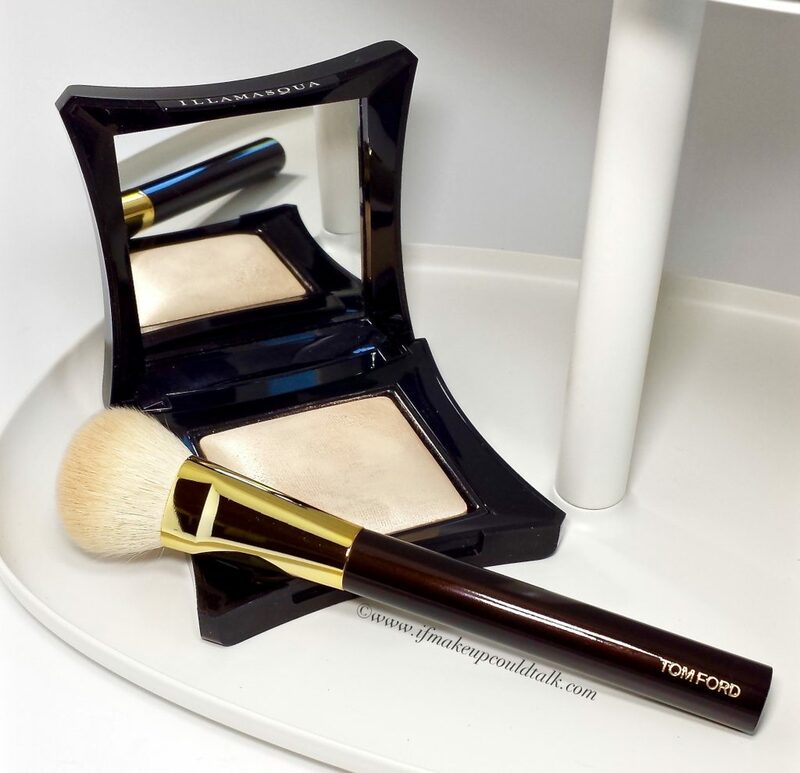 Soft baked powder is featherweight and glides on the skin smoothly. Golden/copper color with a slight rose undertone is ideal for warm, medium, olive and dark skins. 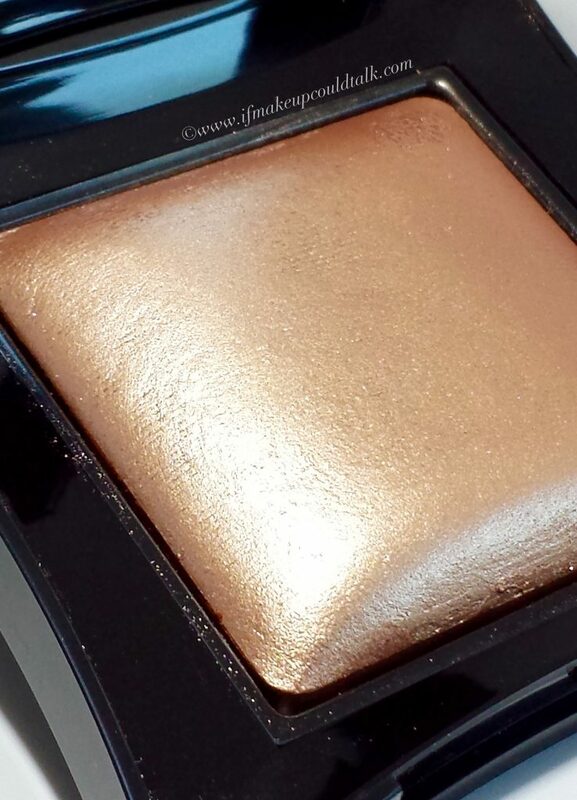 Lighter skins can use Epic, sparingly over a blush or bronzer for added warmth. Can be applied dry for a healthy glow or wet for a flat-out, in-your-face radiance. A peachy sheen emerges the more the powder is blended. Appears very subtle in natural lighting. Formula contains multidimensional shimmers that do not settle on top of the skin, rather blend out to become one with the skin. Lasts on my dry skin for a solid 8-9 hours, with minimal fading thereafter. Can be used anywhere –eyes, face, and body. Formulated with minimal ingredients (see below) sans mineral oil and parabens. 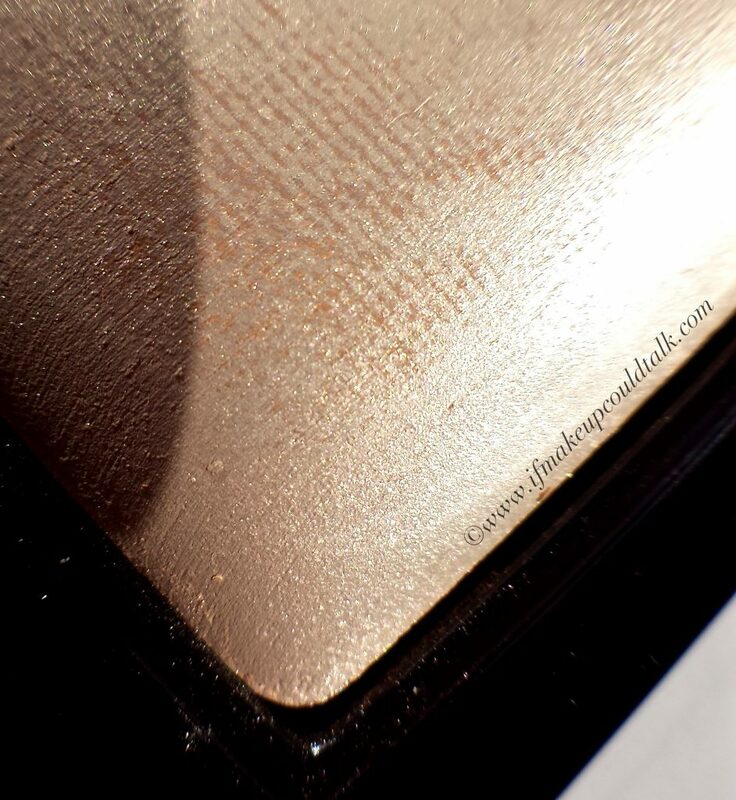 The soft texture inevitably produces powder kick-up, even with the lightest touch. 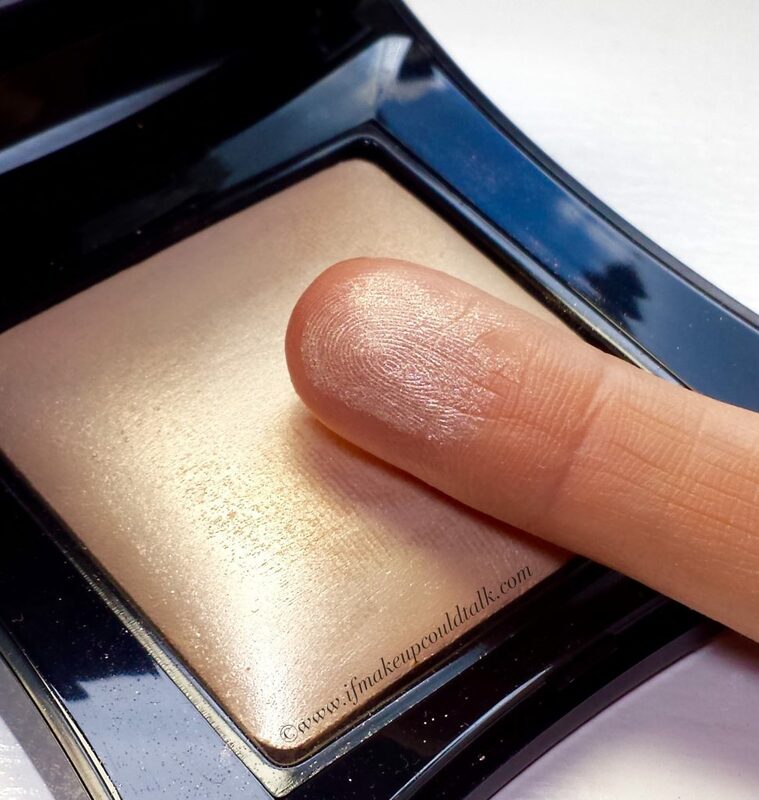 The lightweight shimmers noticeably disperse when tapping off your brush. As a result, the compact gets dirty quickly around the perimeter of the powder and the outside casing is a fingerprint magnet. Massive compact is the size of my palm and takes up a lot of room in a makeup bag. The malleable formula creates a hard-pan look (not feel) on the surface of the powder with every brush stroke (as seen in the fourth photo below)–totally superficial, but worth noting. The sheer nature of this formula will not be suitable for those that desire immediate, high impact results. 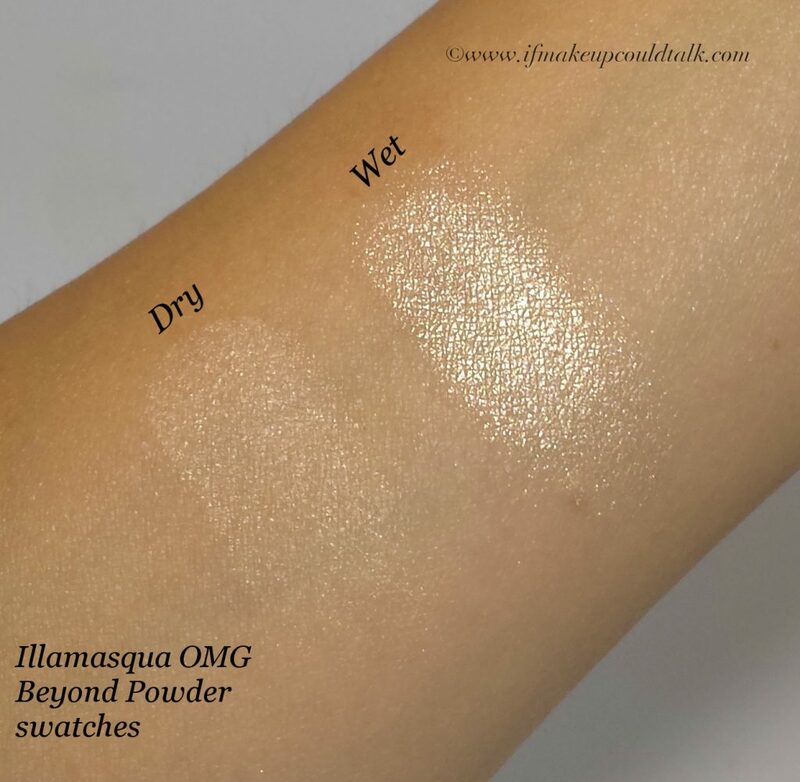 Illamasqua Epic Beyond Powder heavy and blended swatch (photo taken with flash). 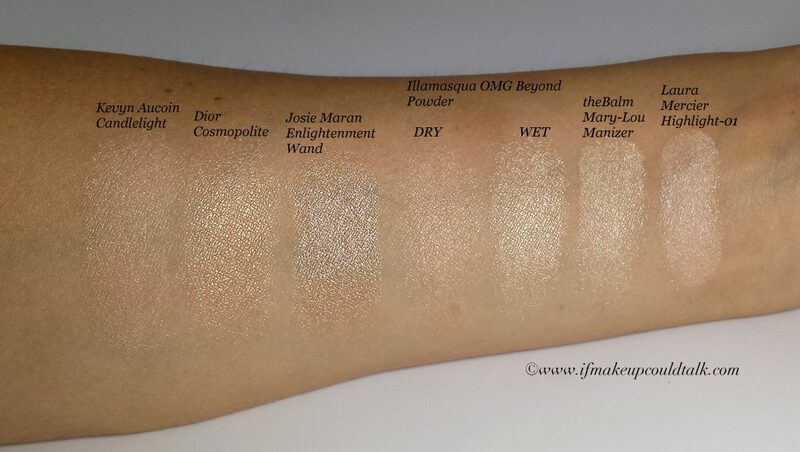 As you can tell when swatched, Epic appears quite pigmented. The ultra soft formula, however blends out rather easily, similar to a cream product. The finely milled shimmers are not pronounced in the least, in fact they almost dissipate into a gleaming veil over the skin. 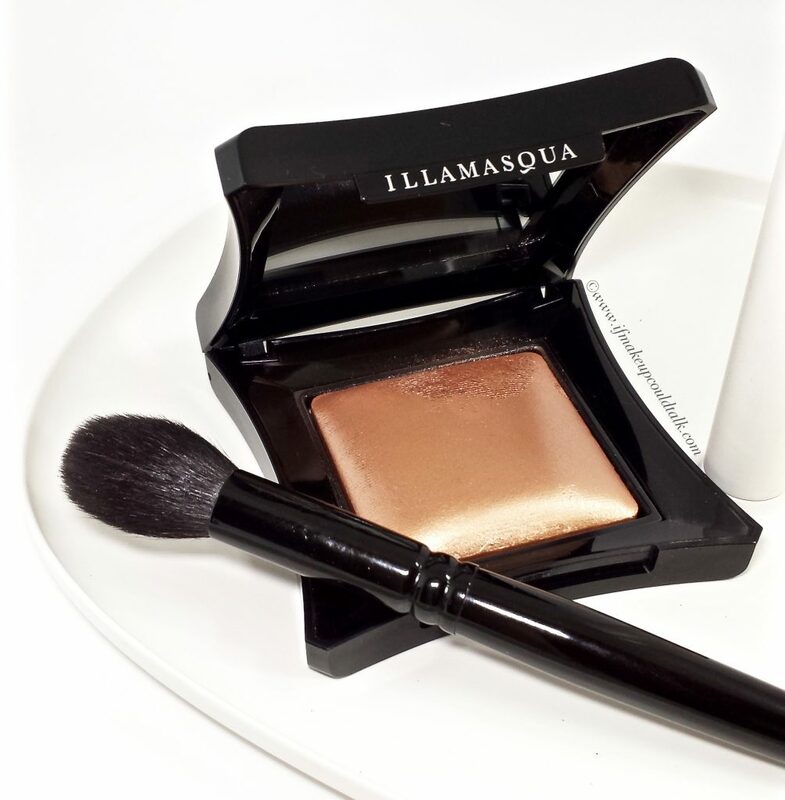 Illamasqua Epic Beyond Powder with Wayne Goss 02 Brush. After trying several brushes, I decided the best tool in my collection suited for this formula is the Wayne Goss 02 Brush. The natural hairs are the perfect length, density, feel and shape for picking-up a modest amount of powder. When attempting to use my Chikuhodo Brushes, I found the natural soft blue squirrel hair too delicate to adhere and blend the powder to my satisfaction. I experienced a similar dilemma when utilizing my Eve Pearl Fan brush. Normally, this is my go-to brush for depositing an elegant dose of radiance, but the feathery composition was not ample enough to hold the lightweight powder. 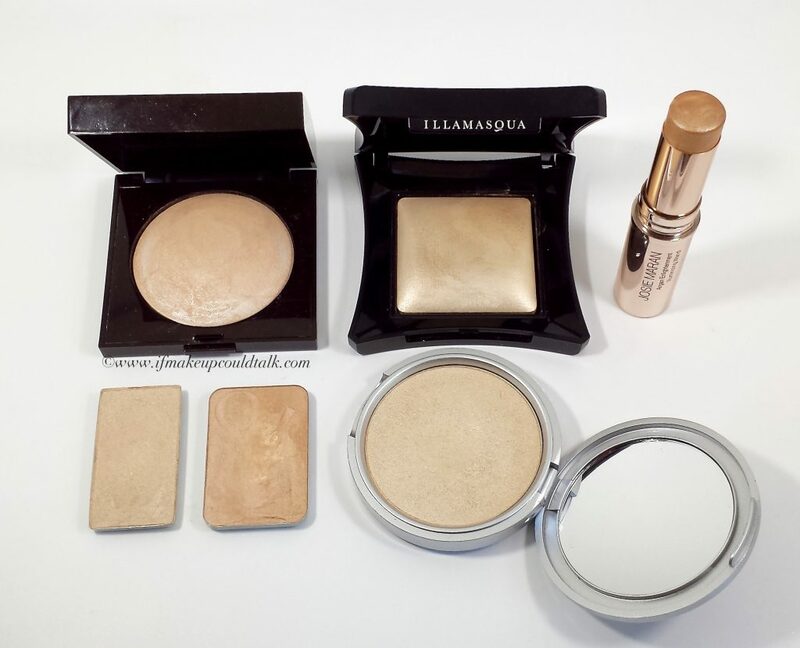 Illamasqua Epic Beyond Powder, Laura Mercier Spellbound, and Anastasia Beverly Hills Mimosa from the Gleam Glow Kit. 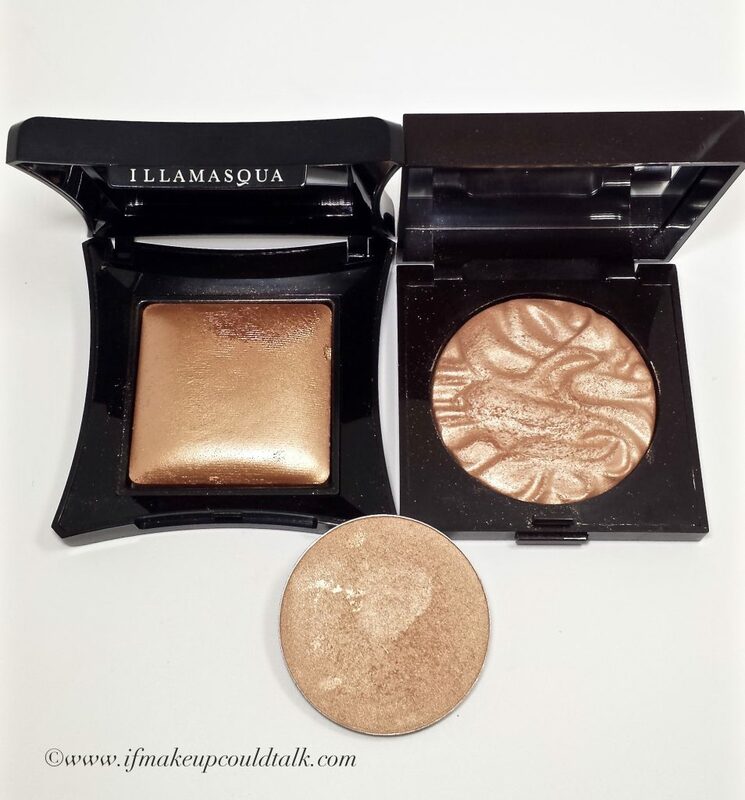 Illamasqua Epic Beyond Powder, Laura Mercier Spellbound, and Anastasia Beverly Hills Mimosa from the Gleam Glow Kit (photo taken with flash). 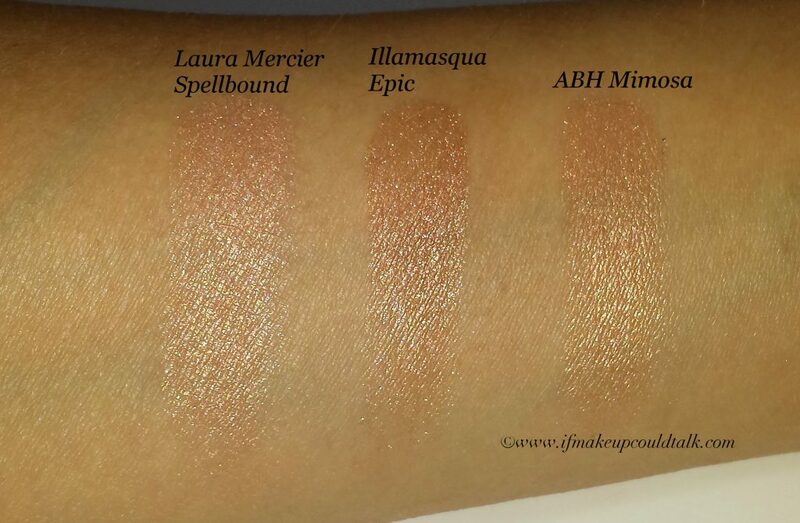 Laura Mercier Spellbound has a more densely pigmented base color than Epic. On first impression, both formulas look very similar, but Spellbound feels more concentrated than Epic. The light peach/gold coloring is great for paler complexions and will produce a noticeable highlight with minimal effort. 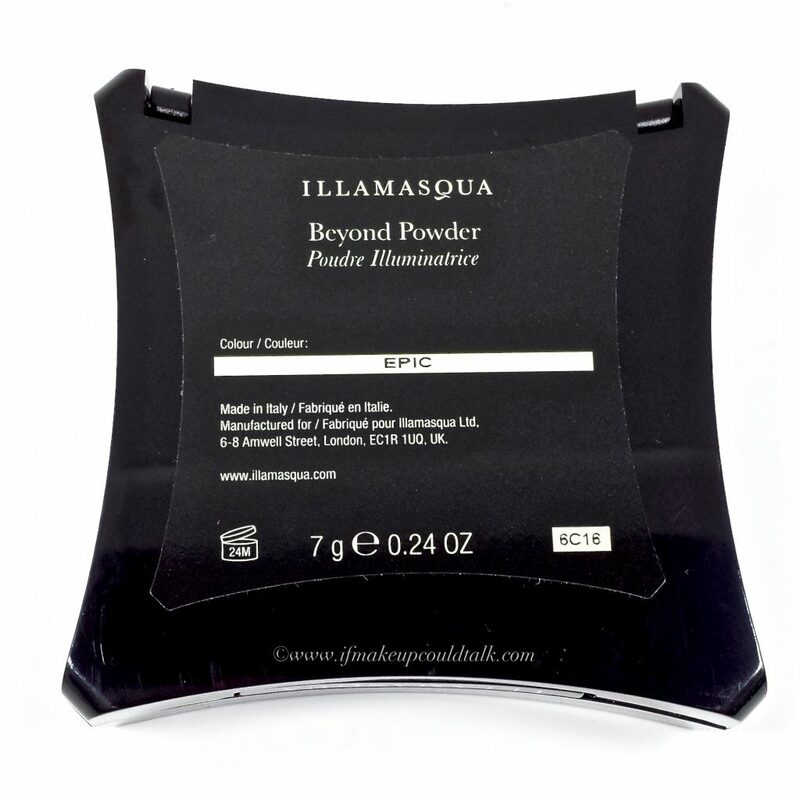 Illamasqua Epic Beyond Powder has an airier formula and the deepest coloring of the lot. With that said, Epic swatches quite impressively compared to actual application. Once applied to the face with a brush, the powder sheers out to reveal a lovely peachy glow. One really has to utilize multiple layers or use the formula wet to get the potency present in the pan. For my personal use, this type of highlighter is held in high regard, it inherently restrains my heavy-handedness. Anastasia Beverly Hills Mimosa is the most concentrated of the bunch. 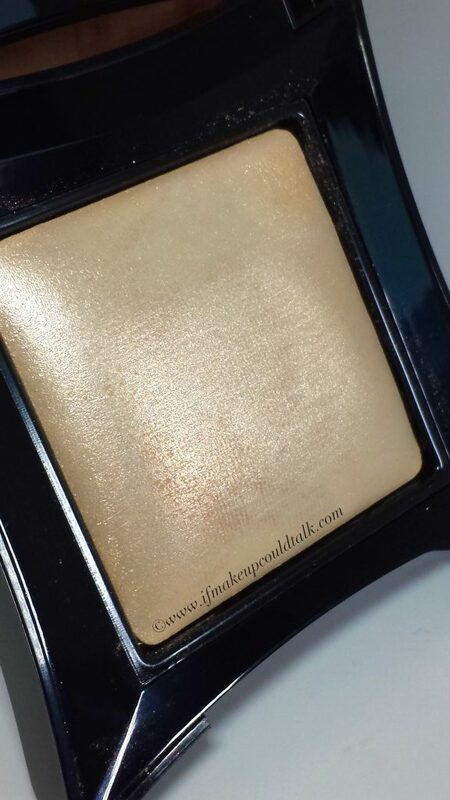 This formula has more gold in the mix and the metallic finish requires a fan brush for favorable results. Personally, I prefer to mix Mimosa to with other subtle formulas to add dimension. 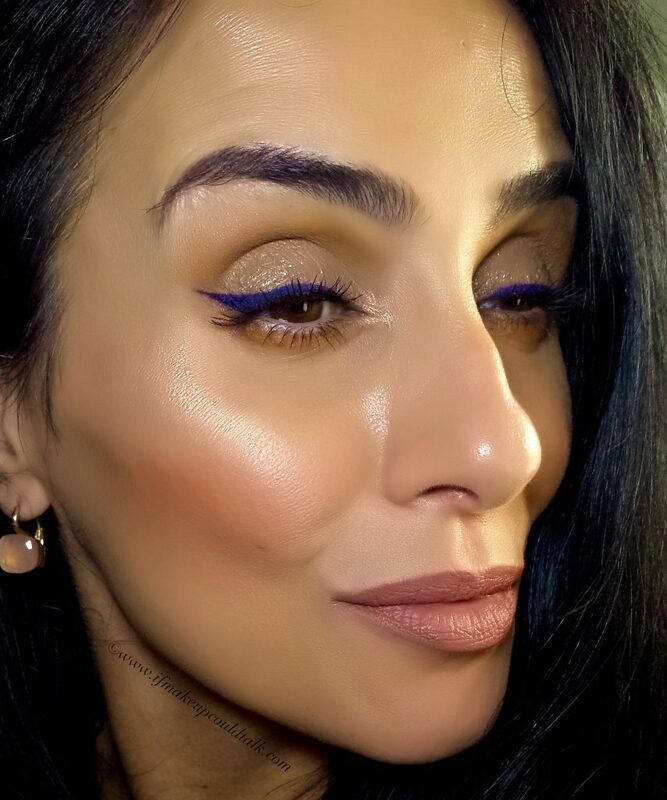 Wearing Illamasqua Epic Beyond Powder as an eyeshadow across the mobile lid, under the lash line, on the cheekbones, in the center of the nose and a bit on the upper lip. 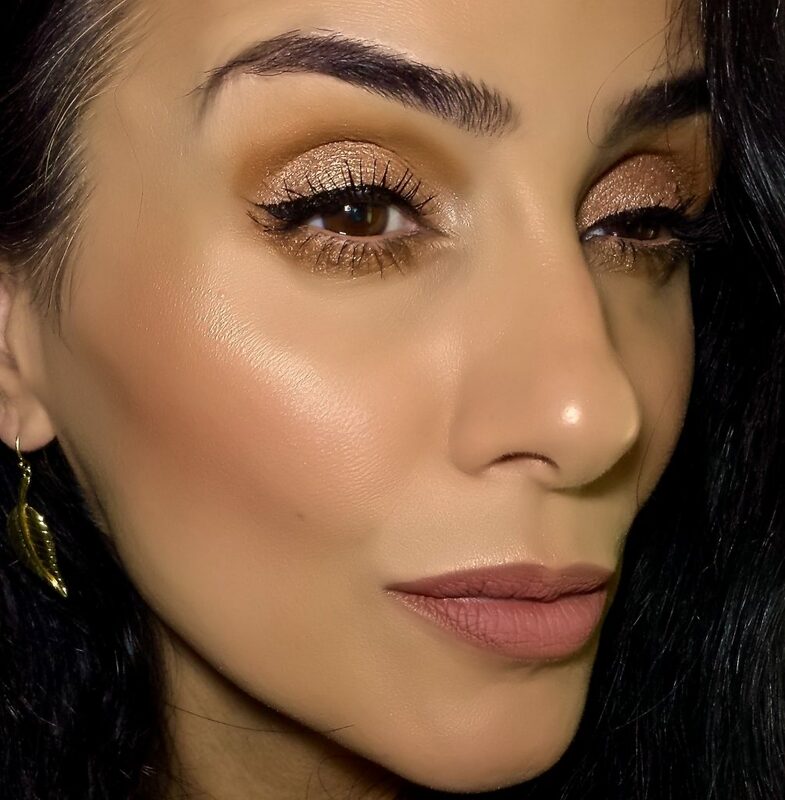 For the above look, I applied Epic on the mobile lid over Bobbi Brown Taupe Eyeshadow Stick (reviewed here) before the cream stick had a chance to set. 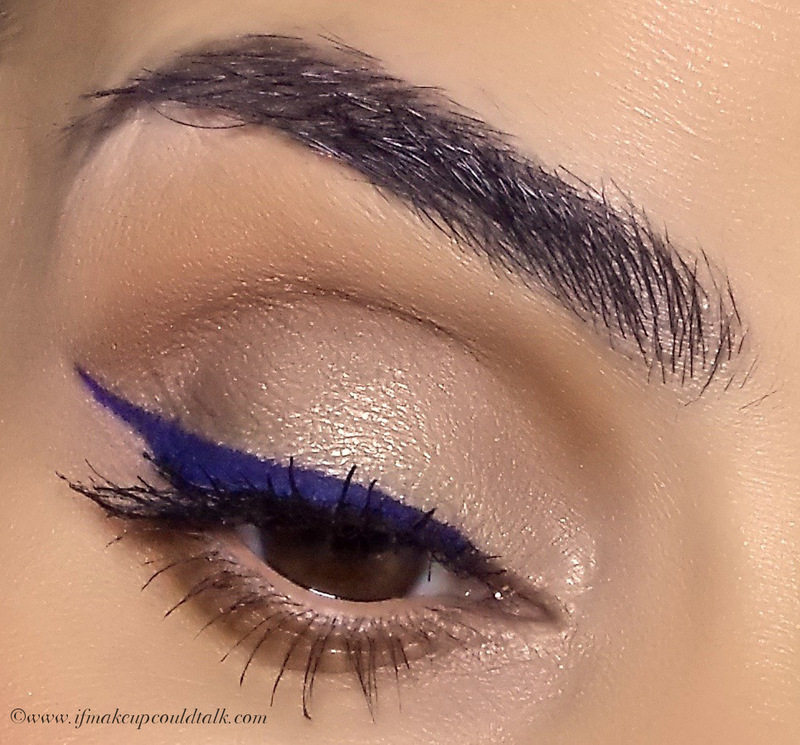 The creamy shadow based was able to encapsulate Epic’s shimmer and pigment for the entirety of the day. I also added Epic on the cheekbones, bridge of the nose and slightly above the upper lip area. 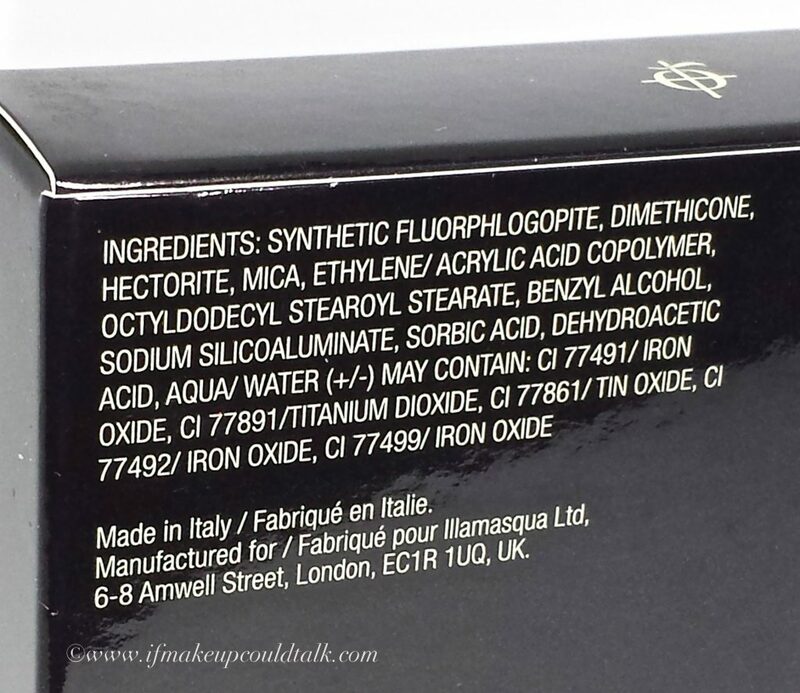 Illamasqua Epic Beyond Powder ingredient list. 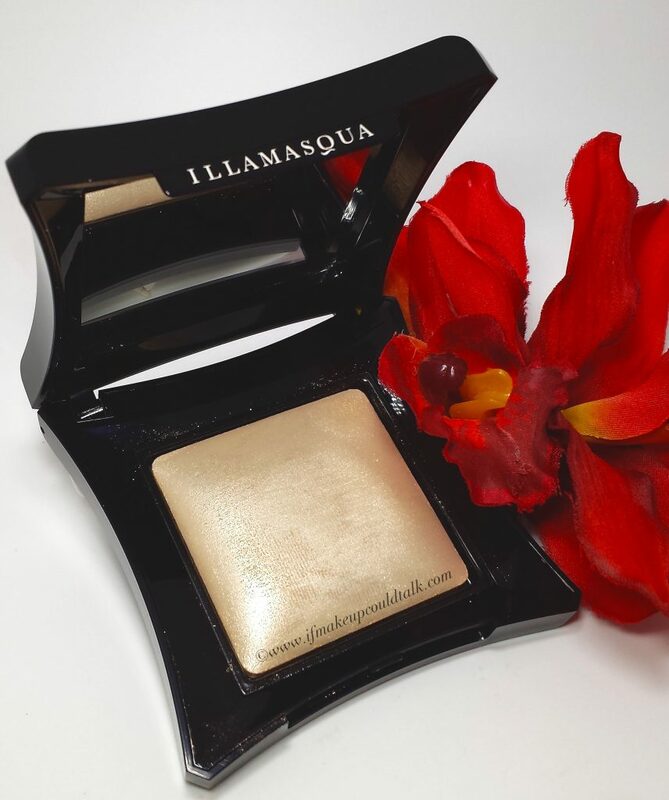 Makeup would tell you Illamasqua Epic Beyond Powder is an epic success for some. The delicate finish will suit those who are not fond of the in-your-face highlighting trend that seems so popular on social media. If you are into beautiful presentation, adjustable coverage, bronzy glow, smooth texture, and gorgeous sheen then Epic is for you. As for myself, OMG is on its merry way to my home as I type. Do I NEED another highlighter? No, quite frankly I need clothes more, but no one can accuse me of sensibility when it comes to makeup. 🙂 Until next time, be well, stay safe and be happy. 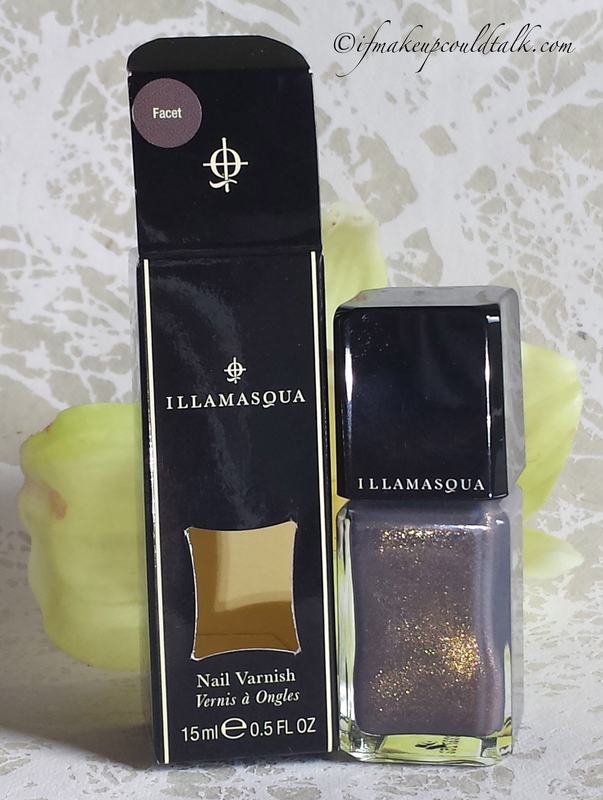 Illamasqua Baptiste Nail Varnish review and removal. For this Nail of the Week, I chose an oldie (my bottle is three years old), but a goody polish from my collection. Illamasqua Baptiste Nail Varnish ($17 USD/.5 fl.oz.) is a gorgeous darkened purple with red and violet micro shimmers. 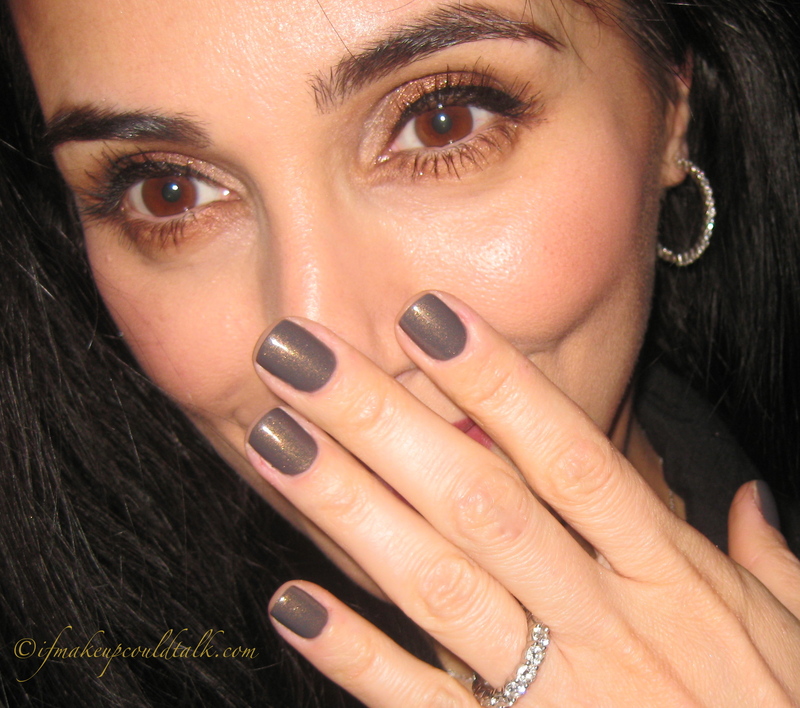 Illamasqua (Cosmetics for Your Alter Ego) makes one of my favorite nail polish formulations. The colors are vibrant, the consistency is smooth, the formula is opaque, and the lasting power is phenomenal. Who wouldn’t love that? 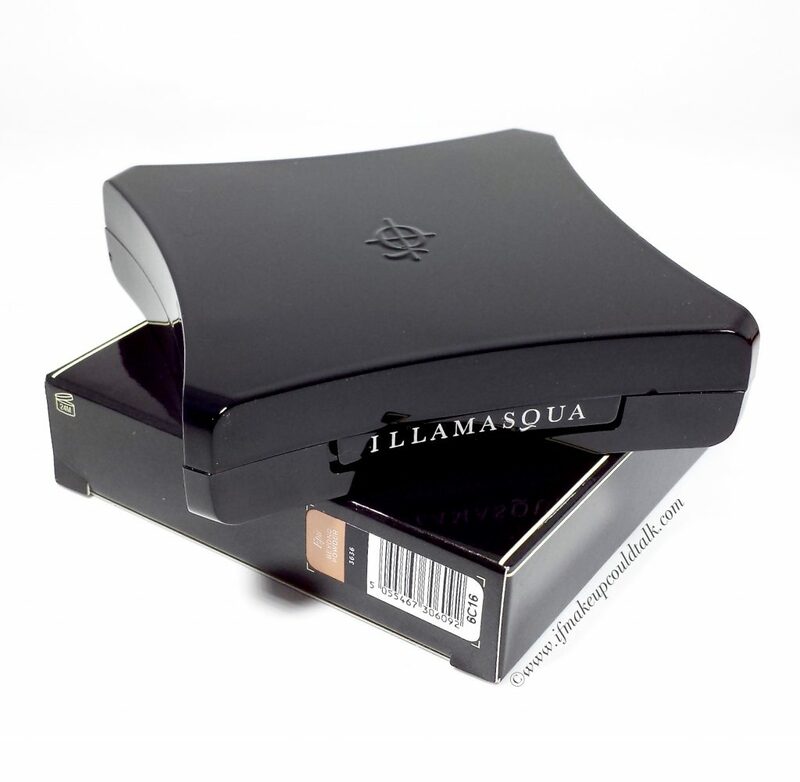 Illamasqua Baptiste Nail Varnish is very dark and almost resembles a black polish from afar. However, this polish really comes to life in the presence of flash photography and sunlight. The extremely fine red and violet micro-shimmers give Baptiste a distinguishable glow. Two coats are all that is needed to achieve full opacity. The brush is shaped perfectly to accommodate a variety of nail widths and lengths. I especially love the longevity of this polish; I can easily get 4-5 days of wear without any chipping. Of course, this will vary according to one’s activities. Applying a fresh top coat to the polish on the third day, prolongs the wear for up to 6 days of chip-fee nails. Illamasqua Nail Varnishes are not promoted as 3-free. 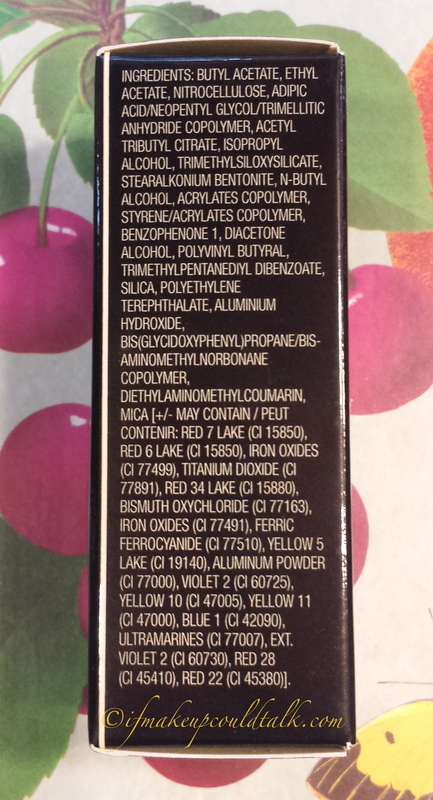 Although, I did not find DBP, Toluene or Formaldehyde (which is actually a gas and technically not present in polishes) amongst the ingredients, Formaldehyde Resin (which is derived from Formaldehyde) is an ingredient. This chemical is responsible for giving polishes shine and durability. 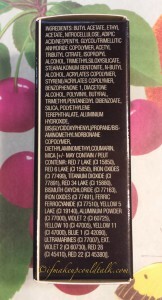 So if you have a known allergy to Formaldehyde, then it is really Formaldehyde Resin that you should avoid in your polish. 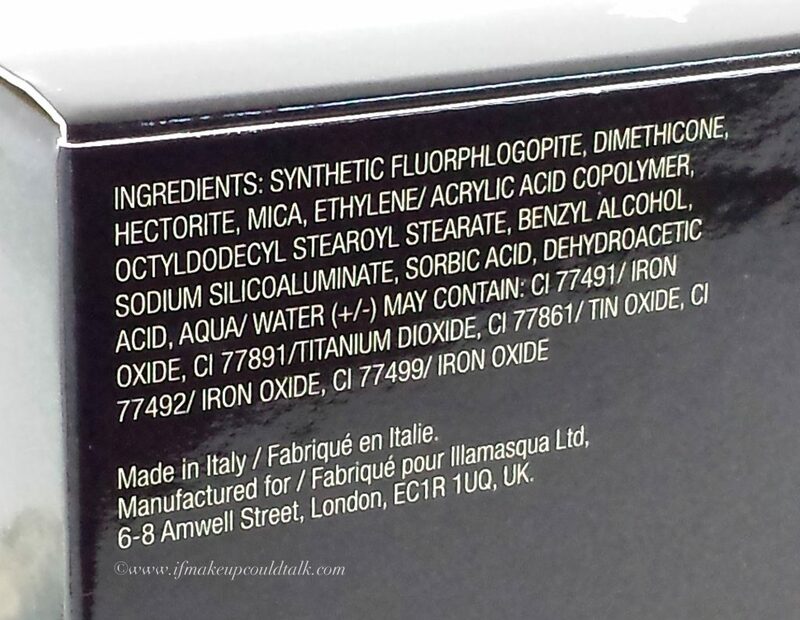 Seeing that FR is the fifth ingredient in Illamasqua Baptiste, this explains why the wear is so resilient. To my knowledge, OPI and Marc Jacob polishes also use FR in their polishes. Therefore, read ingredient lists and decide for yourself. As with my Illamasqua Phallic Nail Varnish (reviewed here), removal can be a little challenging. I find my Zoya nail polish remover and the foil method to work especially well when trying to remove dark and glitter polishes. I realize the initial prep work may seem time-consuming, but the hassle-free removal makes the effort worth it. Foil Method to remove Illamasqua Baptiste Nail Varnish. Cut out ten foil squares and 10 cotton pads split into halves. Saturate each cotton pad with nail polish remover and place it on the nail. Take your foil and wrap it around the saturated cotton pad on each nail. 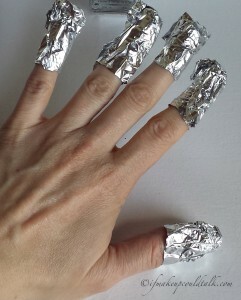 Leave the foil on for 7-10 minutes (longer for glitter polishes), to give the remover time to break down the polish. 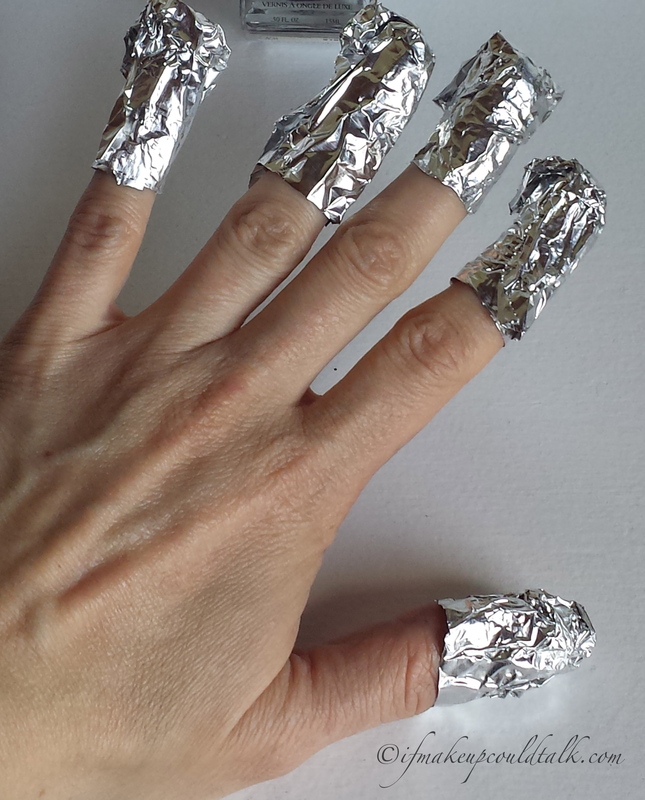 Remove the foil and cotton pad together by wiggling the foil back and forth to make sure all polish has been removed. At this point, any residual polish will easily come off with an additional saturated cotton pad. Ethyl Acetate, Butyl Acetate, Nitrocellulose, Propyl Acetate, Tosylamide- Formaldehyde Resin, Isopropyl Alcohol, Triphenyl Phosphate, Trimethyl Pentanyl Diisobutyrate, Stear- Alkonium Bentonite, Ethyl Tosylamide, Camphor, Diacetone Alcohol, Benzophenone-1, Citric Acid, Dimethicone. May Contain: [+/- CI 15850:1 (Red 7 Lake), CI 15850:2 (Red 6 Lake), CI 77499 (Iron Oxide), CI 77891 (Titanium Dioxide), CI 15880 (Red 34 Lake), CI 77019 (Mica), CI 77163 (Bismuth Oxychloride), CI 77491 (Iron Oxide), CI 77510 (Ferric Ferrocyanide), CI 19140 (Yellow 5 Lake), CI 77000 (Aluminium Powder), Silica, CI 60725 (Violet 2), CI 75170 (Guanine)]. Illamasqua Nail Varnish come in 45 beautiful shades and can be found at Sephora and Bloomingdales.com. Makeup would tell you Illamasqua Baptiste Nail Varnish is a beautiful color. 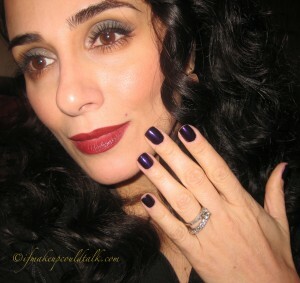 This deep purple hue looks chic and the longevity, consistency and brush head only add to the allure. I absolutely love Illamasqua polishes and would highly recommend you check them out ASAP. Which color(s) will you choose? Be well and stay safe.